The displays of the two devices are the main focus and rightfully so. On paper the LG G2 has a clear advantage with its edge-to-edge 5.2" screen that carries the elaborate True HD-IPS+ LCD nomenclature. Its 1080p resolution is good for around 424 pixels per inch, which is well beyond the point where a naked human eye can differentiate individual pixels. 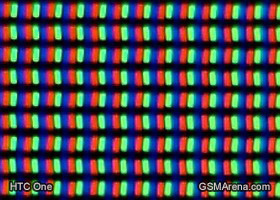 The HTC One brings a Super LCD3 of 4.7" diagonal and the same 1080 x 1920 resolution, resulting in a pixel density of 469 ppi. At this point, though, we'd call the difference impossible to spot. So what about under a microscope? Here they go. 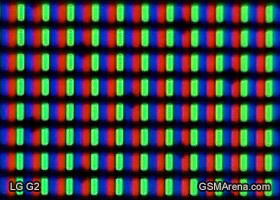 The pixel arrangement is mostly the same, being conventional RGB with the G2 pixels slightly larger than those on the HTC One. Now let's get technical and see what lies beneath the surface. The LG G2's screen is a tiny bit brighter, while the HTC One has a slight edge when it comes to contrast. The differences are so minor though, impossible to spot in day-to-day usage. They are probably also smaller than the unit-to-unit variance that usually occurs. Moving on to contrast under strong light, or otherwise known as our outdoor legibility test. Here the reflectiveness of the LG G2's panel pushes it some way behind the HTC One's score, although neither of the two managed to particularly impress here. All things considered, the two smartphones have top of the line displays on tap. Their contrast and sharpness is evenly matched, and so is the great color rendering. The LG G2 has the size advantage, while the One does better outdoors. Winner: LG G2. The huge difference in size is enough to dwarf the sunlight legibility advantage. Both screens are gorgeous, but the LG G2 simply has more of it. Next we come to the all-important battery life - something power users hold in great esteem. The LG G2 has a more demanding chipset to properly feed and a bigger screen, which should naturally draw more juice. However it also has an ampler 3000 mAh Li-Po unit to rely on. In the opposite corner, the HTC One has a much humbler 2300 mAh Li-Po battery that has to carry the Snapdragon 600 and its 4.7" screen that still has the same number of pixels as the G2 unit. 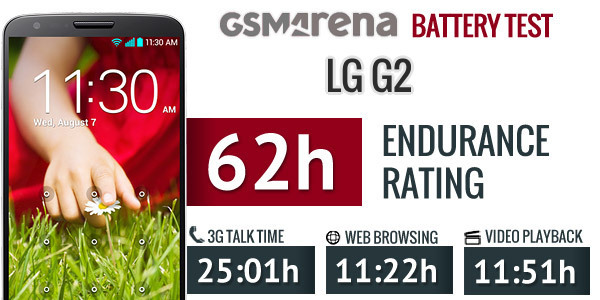 First comes the call time test, which unsurprisingly saw the LG G2 come out on top. With the chipset idling and the screen switched off, its huge battery was made to count and the LG flagship achieved a whopping 25 hours. 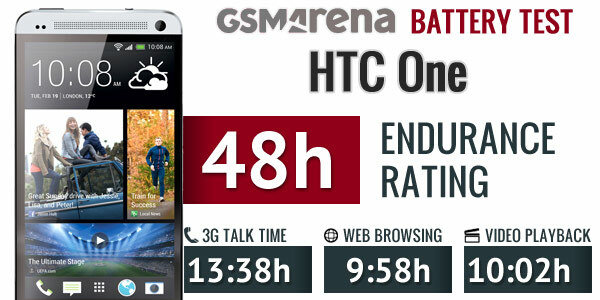 This made the otherwise respectable 13:38 h score of the HTC One look rather miserable. Web browsing saw the two contenders tighter together. Back when it launched, the HTC One was the longest lasting browsing device that we had seen, but the LG G2 did brilliantly to beat that achievement by almost an hour and a half. Video playback is more of the same. The HTC One did quite well, but the LG G2 was still out of reach. So the battery contest has proven to be a rather one-sided affair. 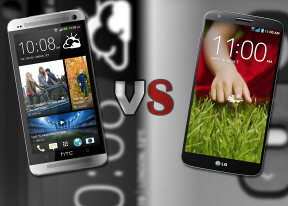 The LG G2 absolutely demolishes the HTC One and with an endurance rating of 62 hours against the 48 hours of the HTC One. More on the LG G2 battery test can be had here and there goes the HTC One. Winner: LG G2. Despite a very respectable performance by the HTC One, the LG G2 is the clear winner here, beating it in every single element of the test.